Ever since my friends brought me to an escape game room on my birthday (Hi guys, if y'all are reading this I love you all so much fo' taking me there!!! *Blow kisses*), I've been hooked ever since. I must've been living in cave because I've never heard of escape game rooms before that, and just fyi, there are more than 10 escape game rooms in Singapore! 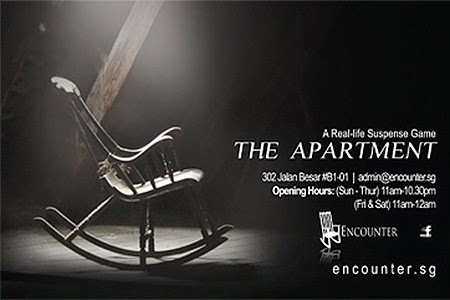 THE APARTMENT by The Encounter. Unlike other escape rooms, The Encounter doesn't focus so much on puzzle-solving instead more on suspense and setting you in the mood with their progressive storyline, which is crazy mindblowing btw. I haven't been to alot of the escape rooms in Singapore but this has got to be my favourite one thus far! In terms of storyline and suspense, The Apartment wins hands down fo' sure. Albeit creepy, the experience was absolutely intriguing & exhilarating. I don't want to spoil the game and disclose too much info but all I can say is this definetely isn't something you'd wanna miss out on. Pssst... just checked out their website and their slots are filling up really fast so if you don't wna miss out click here: http://www.encounter.sg/#!bookings/c4qz to make a booking now! Thank you, The Encounter & Eric fo' hosting us! We had so much fun we couldn't stop talkin' about it even aft the game. Lol. Also, can't wait till their next chapter, The Hospital, comes out!! !